Southampton is the largest city in Hampshire and it ranks as one of the best places to find work in the UK thanks to its thriving economy. There are plenty of jobs to be found across several sectors including education, health, retail and tourism, not to mention the various industries based at the port. Residents and students can achieve a great work-life balance thanks to the ease of access from Southampton to the New Forest and green spaces within the city. London and Portsmouth are not far away, further widening those employment opportunities. The city has a rich and interesting history thanks to its links with HMS Titanic, Spitfires (which were built here by the thousands) and its role in the D-Day operation. Southampton is home to two of our stores - Safestore Southampton, which is close to the South Hants Hospital and Southampton Solent University (perfect for student storage), and Safestore Southampton Quay, which is close to the Quays. Both have onsite car parking and offer secure, individual units ranging in size from 10 sq ft to 500 sq ft+. Our flexible terms mean you can stay for as long as you need or just a week, whether you need storage for household items, student belongings, business stock or archives. There’s no deposit required, simply click and book your unit at your nearest Southampton self storage store today, or use our online contact form and one of our team will call you back as soon as possible. Alternatively, give us a call at either of our Southampton stores to book or for advice on choosing a unit that's the perfect size for your storage needs. Get a storage quote today and reserve a Southampton storage unit for free. We won't ask for a security deposit either. Get 20% off if you need self storage for longer than 12 months. Available at all Southampton Safestore centres. Terms apply. Known as the cruise capital of Europe, Southampton is frequented by millions of visitors each year and has an impressive culture offering from museums and music venues to art galleries and parks. The diverse city also has a fantastic shopping centre as well as a buzzing night life. The city has a strong higher education sector with two universities in the area with a student population of over 40,000 making Southampton a great place to live for locals and students alike. If you're struggling for space at home or needing to store your stuff in between terms, then look no further. 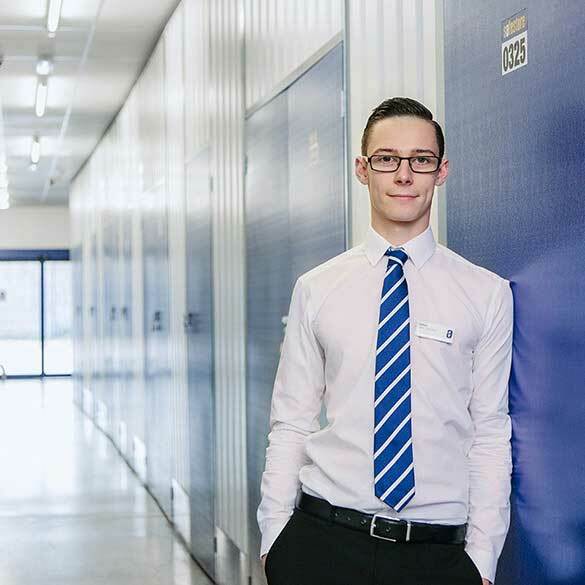 Here at Safestore we are very flexible and offer secure storage solutions tailored especially to your needs, so whether you need a large room for a year or a small locker for a week, we can help. Whether you need help with directions or you’d like a quote, get in contact with our friendly team today to discuss how we can help you. As the commercial, cultural and retail capital of the south coast, Southampton is fast becoming a leading city of innovation with cutting edge research. In addition, the Port of Southampton is Europe’s most productive port, the second largest container terminal in the UK and the UK’s leading port for automotive trade. If you’re looking for a storage space solution in Southampton, then you’ve come to the right place. If you need to expand your business or store excess stock as an online retailer, then Safestore has what you need. All our stores and storage units are protected by state of the art security technology, 24 hour CCTV recordings, fire protection, intruder alarms and in addition, you are the only key-holder who has unlimited access during opening hours. So, you can be certain that your belongings will be safe with us. Get in touch with our team today for a quote or any help regarding the storage process! Southampton is renowned for being a friendly place and our professional advisors in store and on the phone embody just that. Our Southampton based advisors are experts in their field and can help you every step of the way through your storage journey. Safestore, in Southampton and beyond, are proud to have been awarded a ‘Gold Trusted Merchant’ award in 2014, 2015, 2016 and 2017 by Feefo (an independant customer tracking system for businesses), commending our ability and commitment to making customers happy.